DAG / Kishore Singh: "Raja Ravi Varma works attributed to the master require much more due diligence by way of provenance." B&H replies: "The Ravi Varma paintings came with a detailed and unimpeachable provenance running into several lines and covering decades of ownership, including the Archaeological Survey of India’s (ASI) registration details." 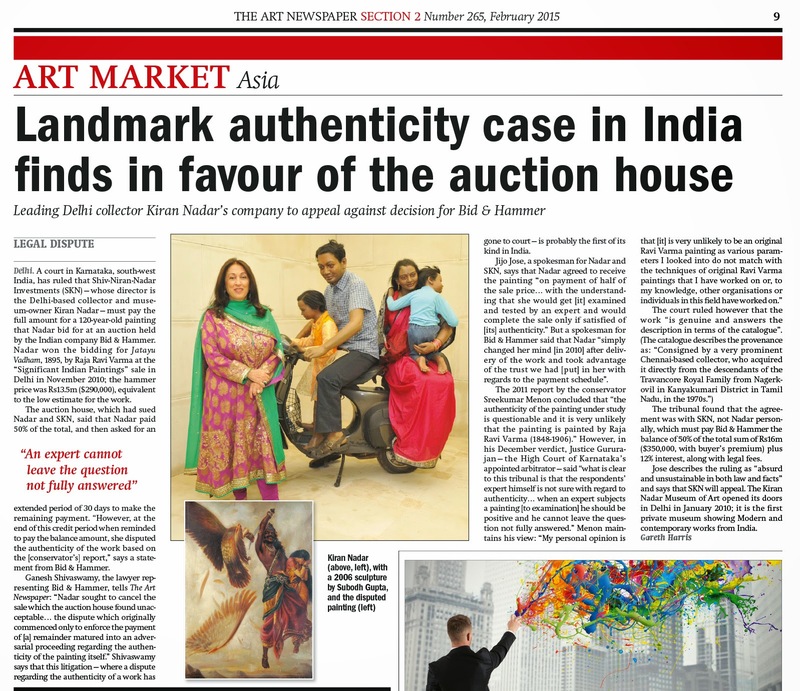 VERDICT: The Ravi Varma works in the auction catalogue got sold including the 'Jatayu Vadha', with the court allowing Bid & Hammer's recovery suit and upholding its expertise on authenticity, apart from re-validating the credibility of the provenance documents. The decisive judgment was delivered by the High Court of Karnataka appointed arbitrator on 12th Dec 2014. Yet another Fake at Christies NY September 2016 Indian art auction? Visit Bid's profile on Pinterest. Copyright 2015 Bid & Hammer. Simple theme. Powered by Blogger.